While in many minds in Germany, the cliché of beret, baguette and red wine is firmly connected with France, the French pendant is the not so serious nickname "Les Chaussettes Blanches en Sandales" (the white socks in sandals). In fact, for more than half a century, Germany and France have been united by a close friendship, reflecting above all in their good economic and political relations. Koenig & Bauer Coding (FRA ) SAS was established on 1 July 2018. Birthplace of this young company is the picturesque village of Vourles near Lyon in the beautiful Rhone-Alpes region, one of the major economic centers of France. Coinciding with the decision to raise the capital, Marcotech's owner, SHINKA HOLDING, decided to sell a block of shares to Koenig & Bauer Coding GmbH, thereby becoming the majority shareholder. In order to optimally use the synergies of the globally operating coding & marking specialist Koenig & Bauer Coding GmbH, a name-change to Koenig & Bauer Coding (FRA) SAS was decided in the first shareholders' meeting. The president of the company is SHINKA HOLDING, represented by its founder, Mr. Fabrice Mauvieux, who had already proven how to successfully manage the fate of (former) Marcotech. He will be assisted by the Directeur Général , represented by Mr. Thorsten Schnatz from Koenig & Bauer Coding GmbH. After the Netherlands, Belgium, China and Poland, France is the fifth country in which Koenig & Bauer Coding GmbH is directly involved and thus continues to focus on internationalization. The sales territory of Koenig & Bauer Coding (FRA) SAS extends beyond the borders of France to include the French-speaking markets of Tunisia, Algeria and Morocco. 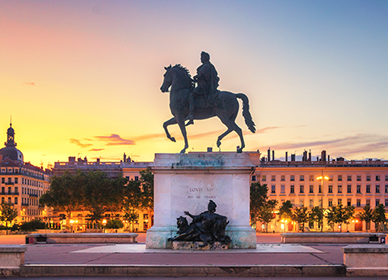 Lyon's central location on the North-South axis of France, its good infrastructure, but also its economic power and history make the "City of Lions" a top location for this young joint venture company.